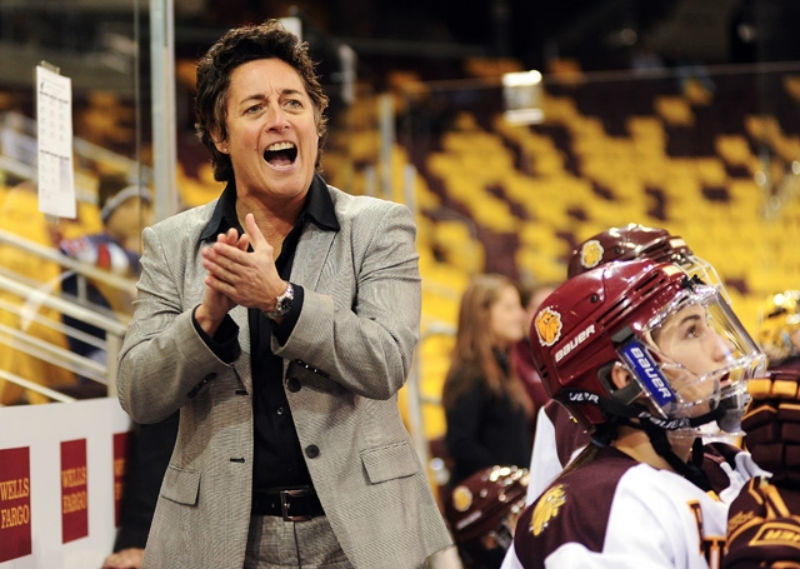 Shannon Miller opens up about being let go from Minnesota-Duluth despite being the most successful women’s college hockey coach in the program’s history. WELL DONE MINNESOTA-DULUTH, WELL DONE. Shannon Miller is the kind of head coach that most women’s college hockey programs around the country would kill for. Her resume details a long list of accomplishments and accolades, including coaching the Canadian Women’s Hockey Team to a silver medal in the 1998 Winter Olympics. She is widely recognized across the ice hockey landscape as one of the most successful coaches in women’s hockey. Shockingly, after 17 years of coaching and putting her all into the women’s hockey program, Miller was callously let go from her position. After this season, her contract will be terminated. The university claimed the move was part of an effort to close a $4.5 million budget deficit. Miller’s salary was $250,000 a year. But the men’s ice hockey coach makes $50,000 more than she does. Additionally, after the 2010 championship, the women’s hockey program budget was cut by $100,000 while the men’s program increased $100,000. Something doesn’t add up. Thankfully, Miller is not afraid to speak up about it. The university is claiming budget constraints as the reason for not renewing your contract. Yet, the coach of the men’s ice hockey team has a higher salary. What are your thoughts on this? Blatant Discrimination. Men are valued. Women are not. Do you feel that with everything you’ve given to the university and the area that you weren’t given the same respect in return when things played out off the ice? I have been lied to, manipulated and treated with a great deal of disrespect. This program could have continued as a dynasty if the university would have put the necessary resources into the program that it requires. There is a serious double standard in how men are allowed to coach and how they are treated compared to women. Men would not have been given a termination notice in the middle of a successful season without just cause, and given a reason of ‘strictly financial.’ The discrimination is painful and alarming. You’ve done everything by the book your entire career. You were even on the Ethics Committee for U.S. Women’s College Hockey. Is the irony of your current situation hard to swallow? Yes, I was the Chair of the Ethics Committee for years and am proud of that. This situation was not handled in an ethical manner. It is just one of many components that is difficult to accept. Women’s college sports teams are often treated differently than men’s. Is this situation a good example of that? Yes, there is a loud and clear double standard in athletics. In men’s athletics, coaches are paid more than a coach doing the same or comparable job in women’s athletics. Female athletes and programs are treated ‘less than’ compared to male athletes and programs. Traits that are admired in male coaches are shunned upon when those same traits are displayed by female coaches. Female coaches are often held to a different and unfair level of scrutiny while male coaches are often left to run their programs as they wish. Blatant. Double. Standard. How do you stay focused on the coaching task at hand for this season, knowing you won’t be back next year? Fortunately one of the many things sport teaches you is focus. Because I am an experienced coach, I am optimistic that I can block out this unwarranted distraction and do a good job with our team. This is an opportunity for our players to hone their distraction skills, develop in this area, and focus on being the best they can be. What’s the biggest take-away you want people to get from this situation? I hope a lot of people will take enough notice that it will open up eyes, minds and hearts and really create change and make a difference. And I hope people behaving in this discriminatory manner will be held accountable. If people in leadership positions are held accountable, and justice is served, change will occur. It’s inevitable. What will you remember the most about your time at Minnesota-Duluth? The good people I met and shared a part of my life with, the tremendous support from quality people in the community, and the players and staff from around the world that I had the privilege to mentor as well as learn from. And coming home with five championship titles. via Shannon Miller let go from Minnesota-Duluth despite being the most successful women’s college hockey coach in the program’s history..